This is the second of three boxes I recently ordered from DACW. I had wanted to do the final Bowman Heritage for some time, but never quite made it around to doing so. And now that prices for 07BH are much more reasonable, now’s as good a time as any. 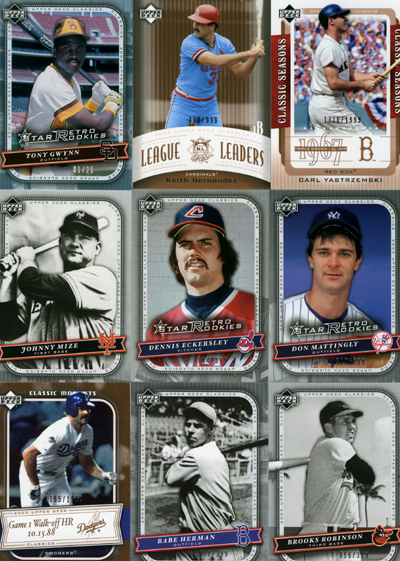 As you know, the Heritage set is split up into a few different subsets: Prospects, Short Prints, and Rainbow Foil. In this instance, the SPs are truly a subset. They’re variants of the base cards, only without the facsimile autograph — even noted on the checklist as the “B” variation, with the regular card as the “A” variation. So one can complete the base set and not be short any cards from the checklist. This is a welcome change, particularly from Topps Heritage, with its usual load of 75 or so short-prints, all of them part of the main checklist. I really wish that Topps would do this for Heritage and Allen & Ginter — make the SPs a variation rather than an additional card. The cards themselves are a faithful reproduction of the original 1952 Bowman set. Given my appreciation for all things vintage, it’s no surprise really that I’ve wanted to complete this set for some time. The checklist is a very manageable 251 cards. Although as you can see here, a single hobby box will yield only half the set, especially with all the inserts included. Still, I can’t complain that the box didn’t produce a single double. Topps sold these boxes with a guarantee of two relics and one auto per box. This box delivered that, and added a blue printing plate and a black-border variation as well. Dude. Bartolo. Seriously, you’ve let yourself go. And Mike Piazza in an A’s jersey? I totally thought this card was of Nick Swisher. But seeing Piazza in an A’s jersey makes about as much sense as seeing Rickey Henderson in a Dodger jersey.